"You are going to do what?" I was spending Easter with my friend Kat. It had been a difficult few months. A profoundly disappointing client engagement led me to want a break from strategy consulting and I had been baking obsessively, building my bread business and trying to decide what to do next. It was clear that I had to do something with bread and I was seriously toying with the idea of setting up a bakery. Something was stopping me, however, and I realised that it was not the right time for me to have a bakery. I wanted to continue to work with people to change the world for the better but I needed to do it outside of the board room. Baking and thinking, thinking and baking, I began to notice that the response to hand-made, good bread was universally and consistently positive. One hundred percent of the time, customers were thrilled with the bread and made me feel good about myself for having baked it. I was making them happy, they were making me happy and more good bread was being consumed by all. It came to me one evening that it would be possible to change the world through bread. If baking and selling good bread made me happy, I was certain it could make others happy. My family thought I was nuts and were worried about how I would pay the bills. Most people I told about the idea thought I was nuts. I spent long, dark days on the sofa thinking I was nuts. Somehow, though, I clung onto the idea that good bread could change the world and that I would be able to make a business out of it. I gave myself a year and over the final months of 2010, I developed Virtuous Bread. I determined the mission statement and objectives, and clarified the main activities and legal structure. It was very clear to me that Virtuous Bread needed to be a profit-making company, albeit one that was not totally dedicated to serving the shareholder's financial goals. To that end, I decided that there needed to be clear commercial activities and non-commercial activities and that the commercial activities would pay the bills and fund the non commercial activities. The split between commercial and non commercial activities would be roughly 80/20, with 80% of the time spent earning and 20% of the time spent volunteering. Both earning and volunteering would involve bread: baking, teaching, speaking, writing, and working with people in general to educate, influence, and lead by example regarding how good bread can positively change individuals, society and the world for the better. Although Virtuous Bread was set up as a limited company, it was always going to be a social enterprise, a fact that Unltd recognised in the autumn of 2010 when they awarded me a £5 000 grant, the first real proof that someone had faith in the concept and sustainability of Virtuous Bread, and for which I thank them from the bottom of my heart. This gave me the courage to set up my first classes and from January to April 2011 I taught a handful of people, finding my way and imparting my skills both as a baker and as a business woman. I genuinely felt (and still feel) like everything in my life - everything I have done and learned - had led me to this point. Virtuous Bread was on course to make it fun and easy for people all over the world to find, make, and learn about bread and in so doing to forge the link between bread and virtue. "Your year is up, what will you do?" 4. I would invest time, not only in the four voluntary activities I had started the year before, but also in speaking engagements, in blogging about bread, business, and social change, and in writing a book about bread in order to reach a wider audience about the positive personal and social benefits of baking and sharing good bread. These were the right decisions to make. By Good Friday 2012, there were over 60 Bread Angels in the UK, South Africa, Belgium, the USA and Canada and between them have baked and sold thousands of loaves in their local communities, built businesses, and taught literally hundreds of people how to bake bread. Many of the Bread Angels have outgrown their home kitchens, moved their bakeries to external premises and/or invested in industrial equipment to enable them to bake at scale at home. There is a terrific social conscience among the Bread Angels - they are linking with transition town movements, attending and developing local markets, engaging communities through local pubs, baking spare loaves to give away, volunteering....the list of the amazing things the Bread Angels are doing is endless and inspiring. Bread Angels are regularly featured in newspaper articles and on the radio talking about what they do to change the world through bread. Because of Virtuous Bread's philosophy regarding the importance of building and maintaining relationships, M Love, a conference for the global mobile industry invited me to open the 2011 session in Berlin to remind delegates that it is critical to consider the impact of technology on society - for better and for worse - when developing technologies for the future. In recognition of the social change Virtuous Bread is effecting, through teaching, volunteering, and Bread Angels, Red Magazine awarded me the "food breakthrough award" in November 2011. As a result of a consistent focus on content expertise, excellent quality, and a focus on accessibility and personal care, the Weston A Price foundation has elected to work with Virtuous Bread to help their members develop a clear and balanced understanding of the nutritional benefits of good bread in general, and sourdough bread in particular. Further, Ryland Peters & Small commissioned All You Knead is Bread - a cook book with stories about bread as a window into society and a unifying force of all humanity. Finally, I was asked to deliver a lecture to the first year students at the Tecnologico de Monterrey, one of the top universities in Mexico, about entrepreneurialism and social enterprise as a necessary and serious career option for them to consider. - set up Bread Angels as a registered charity and develop social programmes associated with it. A £5 000 grant from Richmond council will seed that charity and will be spent sponsoring deserving people in Barnes, SW London to become Bread Angels. 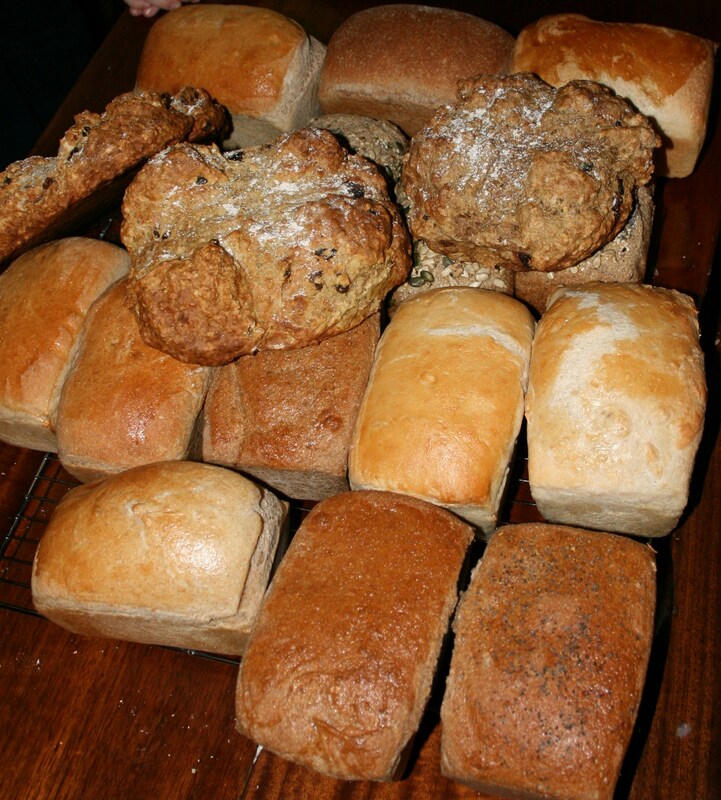 There, we hope to work with a community supermarket/kitchen in Barnes, providing all the bread and holding classes. It's been quite a ride and I am proud - of the Bread Angels, of the students, of the groups with which we have worked and of the financial success we have had. At Virtuous Bread we think money is a great thing - the more we make the more we can do to change the world. It's our choices that matter and I hope I have made some good choices over the past couple of years and, with help from advisors, students, Bread Angels, random strangers, and friends and family, that I will continue to make good choices and have a positive impact on everyone I meet. Thanks to all who have helped me out on this amazing ride. Wish you a good health to be able to do all your amazing projects in order to spread the bread vibe all over the wolrd. well. I am bursting with pride just to know you.